Blackwell Publishers, 1989-11. Hardcover. Good. Wiley-Blackwell; 1 edition (January 15, 1991), 1991. First printing. Hardcover. Fine in near fine dust jacket. Profusely illustrated This a nice clean copy, the spine is solid, The text is clean and pages are not torn or dirty. We provide fast and reliable shipping service. We started to sell on the internet in 1998. We ship from California. Packaged carefully and shipped promptly. All our books are guaranteed. 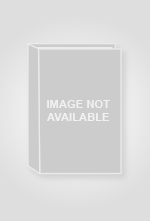 Blackwell Publishers. Used - Good. Former Library book. Shows some signs of wear, and may have some markings on the inside. Cambridge, MA: Basil Blackwell Inc., 1989 Book. 5. Hardcover. First edition, 2 vol. set. Fine in fine dust jacket. Signed and inscribed by author. Clean with no markings, as new. Multiple insets of B&W photographs. Not ex-library. Sewn binding. Paper over boards. 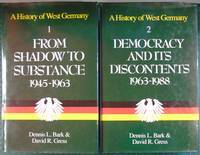 History of West Germany, I. Audience: General/trade. Vol 1: From Shadow to Substance, 1945-1963 (579 p). Vol 2: Democracy and its Discontents, 1963-1988 (545 p.). US shipping only. All proceeds benefit the Burlingame Public Library..
Oxford: Basil Blackwell, 1989. First edition. Hardcover. Near Fine/Near Fine. 2 volume set. 1989, First Edition. Near Fine copies in a Near Fine dust jackets. Clean contents; tight bindings. Sharp dust jackets. Wiley-Blackwell. Hardcover. 0631167870 Like New Condition. . Fine. Wiley-Blackwell. Hardcover. 0631167870 New Condition. . New. Basil Blackwell, 1989. 1st Edition . Hardcover. Very Good/Very Good. 6.5" x 9.25. Volumes One & Two. hardbacks, condition is Very Good. Volume 1 - From Shadow to Substance 1945-1963. 579 pages. ISBN 0631167870. Volume 2 - Democracy and its Discontents 1963-1988. 567 pages. ISBN 0631167889. 1989-05-09. Good. Ships with Tracking Number! INTERNATIONAL WORLDWIDE Shipping available. May not contain Access Codes or Supplements. May be ex-library. Shipping & Handling by region. Buy with confidence, excellent customer service!